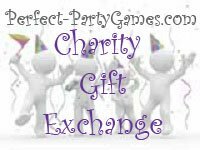 Summary: Where you bring a game to the gift exchange, but the gift is eventually given to charity. 1) Each player draws a name of another player at least one week in advance of the party. 2) Each player buys a brand new game that reminds them of the player whom they picked. 3) At the party, each player gets to stand up and tell all the reasons why the game they purchased reminds them of the person whose name they drew. 4) All the games are then delivered to a local charity for the benefit of needy children.